For many years, the only affordable option available to students was a used textbook. “That typically realized savings of some 25 percent, but that just wasn’t enough, and we had to develop better options. We had to become much more aggressive in finding better solutions for our customers,” Roth says. One of the early initiatives was created in 2003, when the company debuted e-textbooks. “We’ve continued to sell an increasing number of digital textbooks over the last few years, growing in student demand and averaging up to 60 percent off the new print selling price,” she explains, but adds that digital formats still represent a small part of total course materials sold. Students still largely prefer print books, but textbook rentals have emerged as a popular alternative, starting with a small pilot program for the company over three years ago, and now growing dramatically. 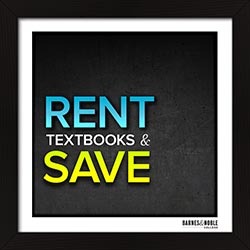 “All of the schools we serve now provide textbook rental options,” says Pat Haze, Director, Textbook Programs for Barnes & Noble College, “and we’ve also grown the number of titles available in the program with over 80 percent of textbooks now eligible for rent.” The savings students can realize from renting their textbooks are substantial. 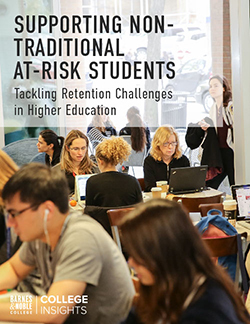 Haze estimates rentals can reduce costs by 50 percent, a significant figure when considering estimates for a typical student’s textbook spending range from $700 to $1,000 annually. Spreading the word about the array of savings options now available is key to the Barnes & Noble College mission. Both in-store and online, students can view all formats that are available for a single textbook and the cost for each option. And through online resources such as FacultyEnlight, an innovative platform that enhances the textbook adoption experience and lets faculty research and adopt textbooks, professors can see the cost of the books they are recommending and better assess their relevance. The platform also allows instructors to communicate with faculty at other schools teaching similar courses, which can reveal more cost effective alternative book selections. Publishers might argue that a college textbook is a completely different product than the typical summer best-seller. Often developed by a team of experts, textbooks require a greater need for accuracy and frequent updates – even the copyright clearances for course materials can be expensive. An individual title may cost well over $100, with many closer to $200. Having a determined mission to help students realize such significant savings might seem at odds for a company in the business of book retailing, but Roth doesn’t see the anomaly.